Baby Activity Centres are perfect for babies who aren’t yet mobile, they are great at entertaining your little one in both a stimulating and educational way and they also allow you to get on with jobs around the house in the knowledge that your baby is happy and in a safe place. From around 4 months old when your baby has good neck and head control they can sit in the specially designed spinning seat and so is able to bounce, move and swivel looking at everything around them. 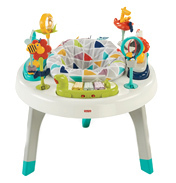 Their feet or tiptoes will allow them to move up and down in the case of the Fisher Price Jumperoo or round and round in the LeapFrog Learn & Groove Activity Station. These Activity Centres have a variety of toys on them, many are electronic with flashing lights and sounds and the theme varies depending on the toy. Some have alphabet learning activities; some have very simple rattles and shakers. The heights on the Activity Centres can be adjusted so they grow with your baby, the toys can be easily cleaned and the seat inserts are very easy to remove and wash just in case any accidents happen. Overall they really are a very useful addition to your growing collection of baby toys. Baby Swings are also great for when you need a bit of hands free time. They are designed to keep your baby comfortable and relaxed. Many play different kinds of music, lullabies and even nature sounds to help lull your baby to sleep and for you to have a well earned rest. 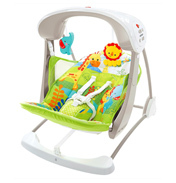 The Chicco Polly Swing Up has a reclining seat and a removable newborn insert; it can also be operated by remote control. As space is becoming such a premium these days one of the excellent features of this swing is that it is compact when folded and not in use. Do you choose an Activity Centre or a Baby Swing or both? They are both excellent products that we are sure you will find very useful.